To be clear, the intent of our Ratings system is to take a sophisticated look at racing statistics and synthesize information onto an easy-to-use 100-point scale, to accelerate the process of understanding a race. Below, you will find information about these new additions to the Key Ratings Box, as well as a Frequently Asked Questions section. As always, we’d appreciate any feedback posted in the comments section below. Trainer ratings have now been added to the “Key Ratings” box in the past performances. These ratings are on a 0-100 scale, and the goal here is to show you how a trainer performs overall, and how he performs in specific situations. After considerable testing, we are utilizing a large amount of data to create these figures, with some data points being weighted more than others. For example, a trainer’s stats from the past year are weighted with much more importance than his stats from five years ago. It’s worth noting that these trainer ratings utilize a “long view” approach, evaluating a trainer’s performance for the previous five years rather than relying strictly on recent results. In keeping with our “real time” mission, these ratings are updated throughout the day (usually within 30 minutes after each race). Additionally, we look back five years from “today,” on an ongoing basis, so if you look at a Saturday racecard on a Thursday, and again on Saturday, you will frequently see evolving ratings. The ratings are a finely-tuned balance of key trainer metrics: Win Percentage, In-The-Money Percentage, Win ROI, and Show ROI. The Win Percentage and In-The-Money Percentage components both account for field size, so a trainer who wins a race with a large field will be rewarded more than a trainer who wins a race with a small field. We put considerably more weight on a trainer’s Win and In-The-Money Percentage than we put on his Win ROI and Show ROI, but again, note that all four factors are used in creating these ratings. A trainer could potentially win at an undistinguished percentage but receive a fairly high Trainer Rating if his runners have a sensational ROI. Finally, in a nod to the profession’s most sought-after wins, we lightly adjust trainers’ overall ratings (but not subcategories) for those with success in Grade 1 races. In the example to the right, Alan Iwinski has an overall rating of 71, and a rating of 64 at Belmont Park. But he has had less than 20 starts at Belmont Park in the past two years, so his rating is in a white box. Right now, we are showing “Today’s Track” and “Today’s Days off” as the two default sub-categories. A “more ratings” gives you a more comprehensive look at a trainer’s success rate in situations like today’s. The Days Off sub-category looks at the numbers of days since a horse’s last race, and adds and subtracts 25% to find a range. In the example to the right, this horse has had a 27-day layoff. Subtracting 25% gives you 20 days, while adding 25% gives you 34 days, so the range being used to create the trainer rating is 20-34 days. All of trainer Jena Antonucci’s horses running on 20-34 days rest (in the past five years) would be used to create this trainer rating. The Past Year section of the Key Ratings box gives you a trainer’s raw stats (starts, win percentage, and in-the-money percentage) for the previous 365 days not the calendar year. This is an effort to give an adequate sample size for all trainers. Soon, you will be able to see raw stats for additional sub-categories and ratings. You’ll notice that in the Last 2 weeks column, we now only show a trainer if he/she is particularly hot or cold. While there are rules regarding number of starts, generally, performing at 40% or better in the win percentage will earn a “hot” rating. “Cold” ratings are generally for win percentages of 5% or lower. But again, this varies for trainers, jockeys, and for the overall trainer category and the sub categories. For more specific ratings click on the green “More Ratings” text at the top of the key ratings box. When you do a pop out box will appear showing the most relavent trainer ratings for the circumstances of this race. 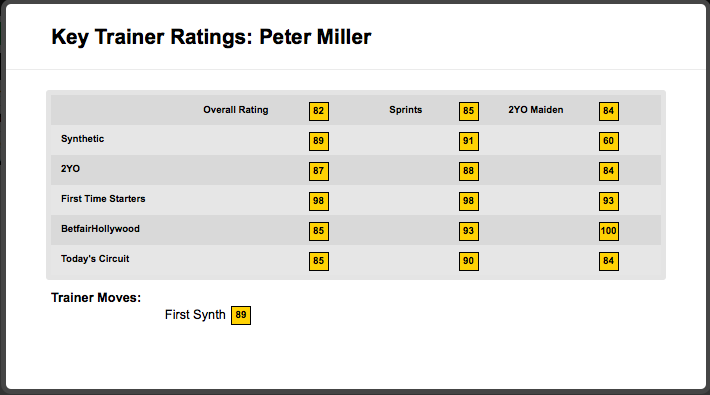 Shown below are the ratings that appear for Peter Miller with a two year old first time starter at Betfair Hollywood Park. To return to the PPs when you are finished just click any area outside the Key Trainer Ratings pop out box. Q – Is the “today’s track” sub-category specific to today’s surface and conditions? A – No, it represents races on all surfaces and under all conditions at today’s track. The trainer pop-out box will contain ratings for today’s track broken out by the condition and surface of the race.